Grandson number two, who is ten going on eleven years old, has proudly earned the moniker of Bug Man because of his remarkable compassion and love for bugs of every kind, and their apparent attraction to him. Personally, when I think about loving all of God’s creatures I usually overlook insects, probably because I don’t care for them. For one thing, they’re not furry. They don’t have deep brown eyes and twitchy tails. Except for ants and termites, they don’t have much interaction with each other except as potential food sources. Even sexual liaisons can have fatal consequences. They have way too many legs, body parts, mouth parts and beady little eyes to suit me. They don’t seem to care if humans exist or not. Unless they’re fleas, mosquitos or ticks they probably would prefer that we were gone from the earth so they wouldn’t get stepped on or sprayed with insecticide. You could say something similar about sea creatures. They don’t have fur, they don’t express themselves in a way that we can identify and don’t show any apparent signs of expression or affection, but I’ve seen too many episodes of Flipper to believe that. Yet here is Bug Man who has so much empathy and love for the least of God’s creatures that I have to marvel at him. One moment he’s threating to pound his brother into a blob of gelatin on the floor for touching his fruit loops, the next he’s saving a poor unsuspecting moth from certain annihilation from grandma, carefully scooping it up and carrying it outside to where it can start a new life in the bushes. Once when Bug Man was seven I took the kids on a river boat ride. I heard him call my name and turned around to see him standing on the side of the boat with his arms stretched out. There, lined up in neat rows on his arms, were six or seven dragonflies. They alighted on him for some reason and stayed there for quite a while. He never moved, enjoying the dragonflies more than the boat ride and scenery. This week Bug Man, his brother, his mother and I all went to the beach for a short vacation. The sky and the water were beautiful and the boys had the time of their lives in the sand and waves. Suddenly Bug Man came running up to the blanket with a large monarch butterfly that he plucked out of the water. “Look, Grandma, I think it’s still alive. It’s little leg was moving.” He set it down on the blanket in my care so that the sun would warm it. I watched it for some time, but it didn’t move. Just as I began to think that the little butterfly was too far gone it flipped over and tried to open it’s wings; however, the wings were still wet and stuck together and it fell over onto its side. It tried again, but failed and once again fell over. On third try it managed to stay upright and the wings parted. It was beautiful with it’s shining wings practically glowing in the sunlight, as it stood motionless on the blanket with the wings open to the warmth. About this time the Bug Man came back from his shell collecting to see if it was surviving and was pleased to see that it had. 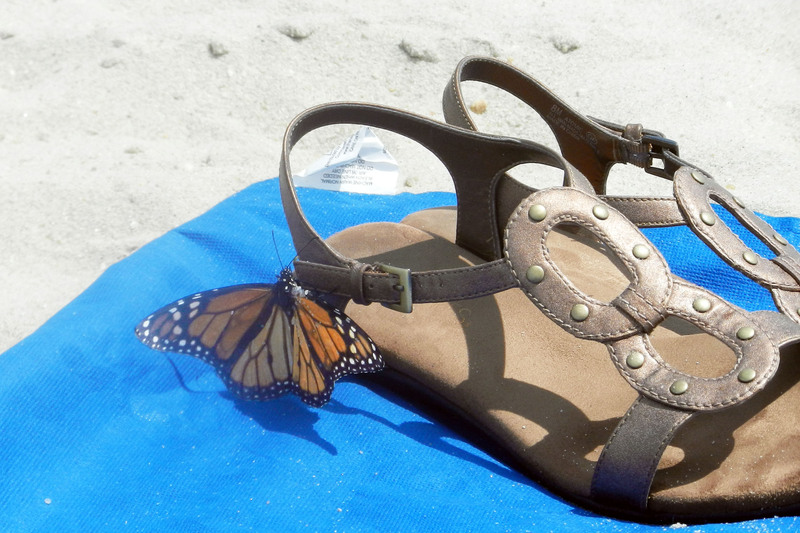 The butterfly began to walk a bit, trying to climb up onto my sandal. Bug Man put his finger under the butterfly’s legs and lifted it up. He then sat down on the blanket with the little creature on his lap, talking to it and encouraging it to fly. Finally, it’s strength renewed, the butterfly took to the air and continued the journey it had started many miles before. Bug Man watched it until it was out of sight. So, Bug Man, thank you. I came to the shore with a head full of worries and discouragements that I needed to pray for. I spent as much time as possible on the sand trying to lift up these cares to God. Bug Man showed me all I needed to know. This entry was posted in The Church Diva and tagged bugs, butterfly, Catholic, Children, gospel, Matthew 10:29, Music. Bookmark the permalink.